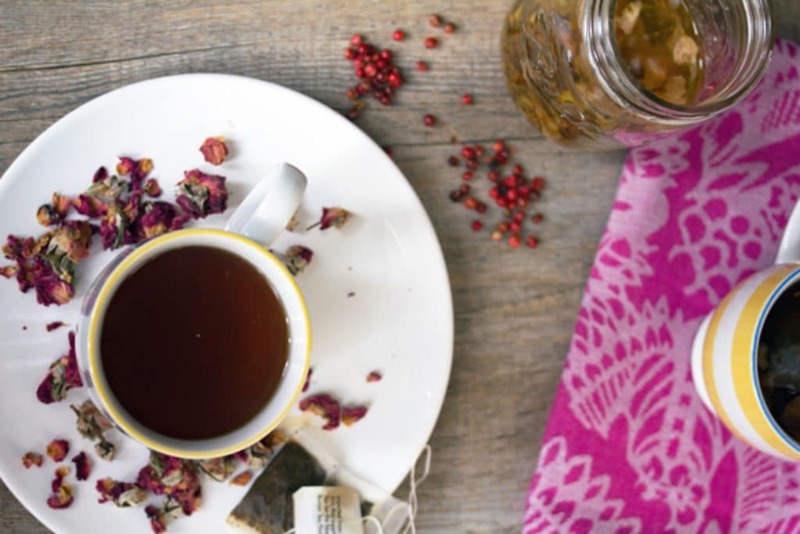 This English Rose Cocktail combines rose-infused vodka, pink peppercorn simple syrup, and black tea for the most perfectly warming winter tea cocktail. 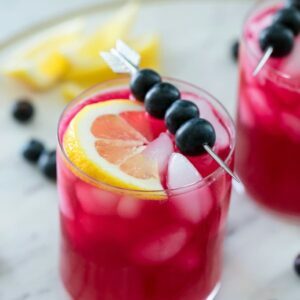 It’s been wayyyyyy too long since I’ve written a Cocktail Friday post. What has become of me? But now that it’s basically 0 degrees out (and by basically, I mean 1 degree. ONE), a cocktail on a Friday never sounded so good. How do my winter drinks differ from my summer drinks? Well, sometimes not at all. After all, a vodka and soda (sometimes Grey Goose, sometimes Tito’s, and sometimes Deep Eddy Grapefruit) is always in season. But margaritas and mojitos aren’t always winter appropriate (unless we’re talking cranberry or pomegranate versions) and a hot toddy? Not exactly what you want on a 90 degree evening. 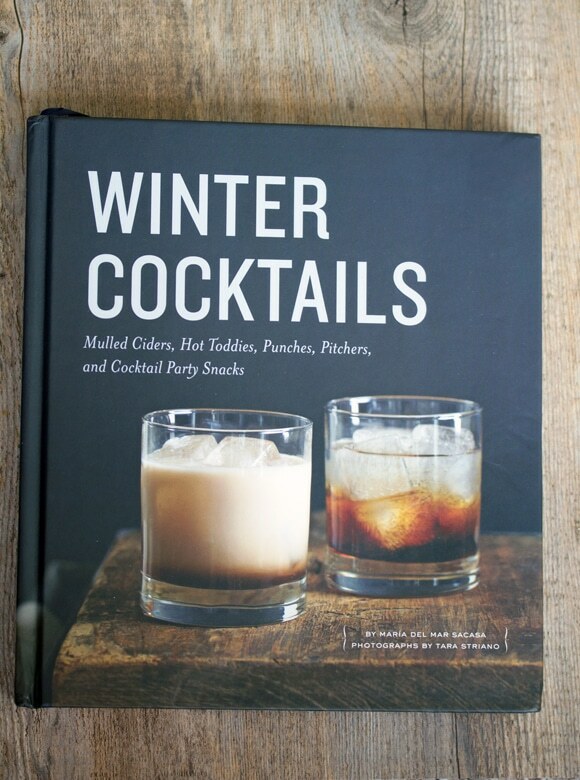 I was psyched when my friends at Quirk Books sent me their Winter Cocktails cookbook (do you call a cocktail book a cookbook? Or a mixing book? Hm) because nothing is better on a freezing winter night than a couch, a blanket, and a warm-me-up-cocktail (OK, Dateline and someone to snuggle with are pluses, too). The book is a beauty and the illustrations perfection. Like seriously? This photo would fit perfectly into my “Aftermath” book. It’s the nonexistent book I’ve long been planning featuring photos of cooking aftermath. I love a good cluttered countertop. It didn’t take me long to decide I wanted to make the English Rose Cocktail for about a million reasons. a) hot tea, b) rose-infused vodka, c) pink peppercorn simple syrup. All good things. I purchased dried rosebuds on Amazon, figuring there’s lots I can use them for (you know, kinda like I purchased dried lavender for a cocktail over the summer and then didn’t use it ever again… But I will. Really, I will.) Instead of making a huge batch of infused vodka, I decided to start with a cup to make sure I liked it. I simply let a small handful of rosebuds sit in a mason jar with a cup of vodka in it for about 24 hours. I’m actually not a big rose lover in real life, but these dried rosebuds smelled really delicious and more herbal than floral…. almost like tea already. I love it. I also bought pink peppercorns from Amazon.com. THANK YOU Amazon for basically letting me order any crazy thing I want and delivering it to me within 2 days. What the heck kind of world do we live in? I don’t know, but I love it! 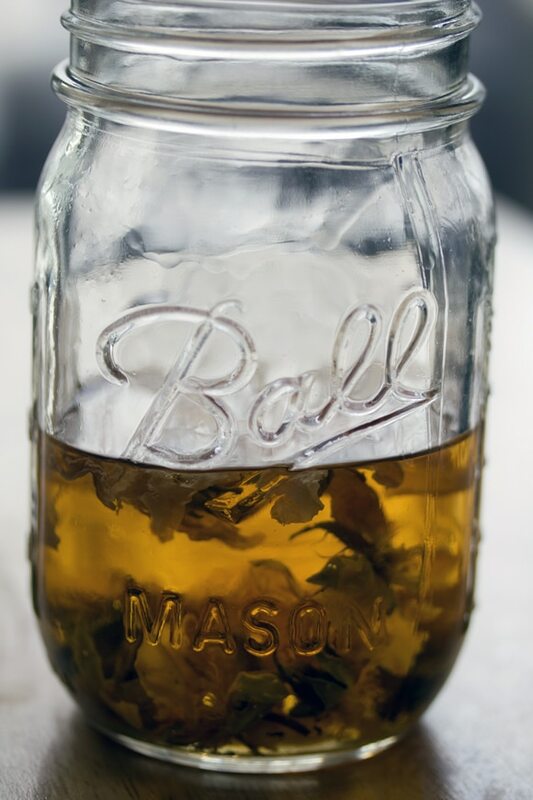 I made a full batch of this simple syrup because um, I knew I would highly enjoy it. First I used my mortar and pestle to crush the 1/4 cup of peppercorns. Have I mentioned I love any opportunity to pull out my mortar and pestle? Because i do. These already smelled so good. In a medium saucepan, I combined the sugar, water, and crushed peppercorns over medium-high heat. I stirred until the sugar was dissolved (about 5 minutes) and then removed from the heat to cool to room temperature. Then I strained the mixture into a mason jar and popped it in the fridge until I was ready to use. I also tried a little taste of it and oh my God, SO GOOD. It’s obviously sweet, but with a super fun kick. New favorite simple syrup. And that’s saying a lot for me. OK and now we’re ready to make the rose cocktail. I made two cups of tea, put 1.5 ounces of the rosebud vodka into each, along with a couple spoonfuls of pink peppercorn syrup. What. I can’t even get over how amazing this is. Why haven’t I been adding vodka to my tea all of my life?? Well, maybe not all my life, but at least for the last couple years?? Also, why have I not been infusing my vodka with rosebuds? Why haven’t I been making rose cocktails forever now? And furthermore, why have I not owned pink peppercorns until now? 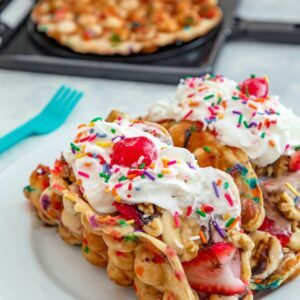 What other culinary awesomeness have I still not discovered? How many more surprises does life hold? So many questions! But honestly, this is the most perfect winter drink ever. 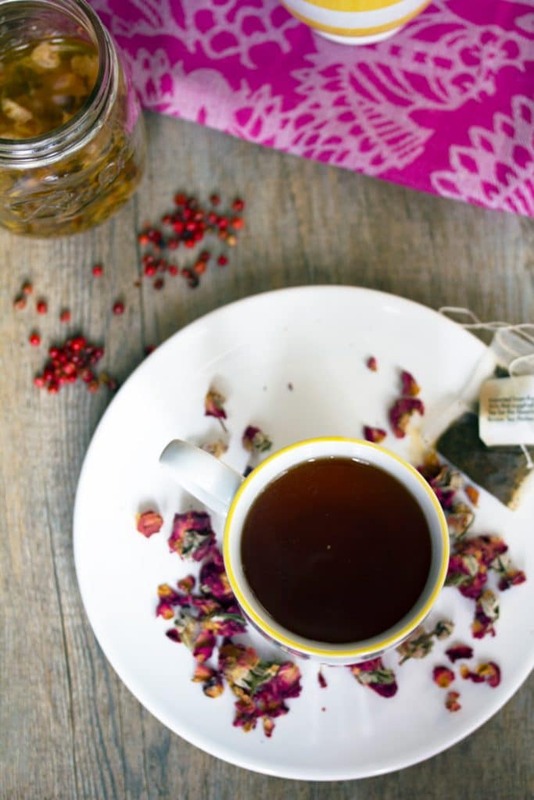 It’s cozy, spicy, and just a little bit floral. In a nice way. I promise it’s not too much. I have a ridiculous amount of tea in my apartment. Because I love it and have collected an insane amount. And also because tea was part of our wedding favor and we had tons leftover (we gave sweet tea in a mason jar to represent Chris being from Virginia- sweet tea- and me being from Boston- Boston tea party… fun, but note that if you’re purchasing lemons to put in mason jars, you should make sure they’re very small lemons…. not something you want to figure out the night before your wedding. Oops!). In any event, I will almost certainly be enjoying this rose cocktail throughout the rest of the winter. And maybe even drinking the peppercorn simple syrup by the spoonful. Other drinks in my new Winter Cocktails book I need to try immediately? Nutella Melt, Cup of Thai, White Sangria, and Butterscotch Eggnog. But probably all of them. Because mmmm. And brrrr. And I’m pretty sure it’s going to be negative something degrees tonight, which means I may have to wake up in the middle of the night and enjoy another one of these. Such is life. But really. 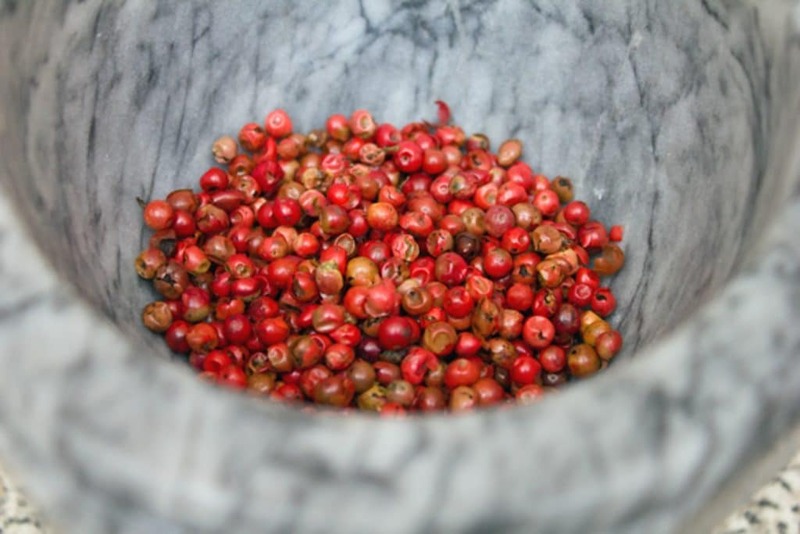 What else can I do with these pink peppercorns? Ideas? I want to crush them in my mortar and pestle and put them on EVERYTHING. Cupcakes? Hm. Stay tuned. What winter drinks warm you up? 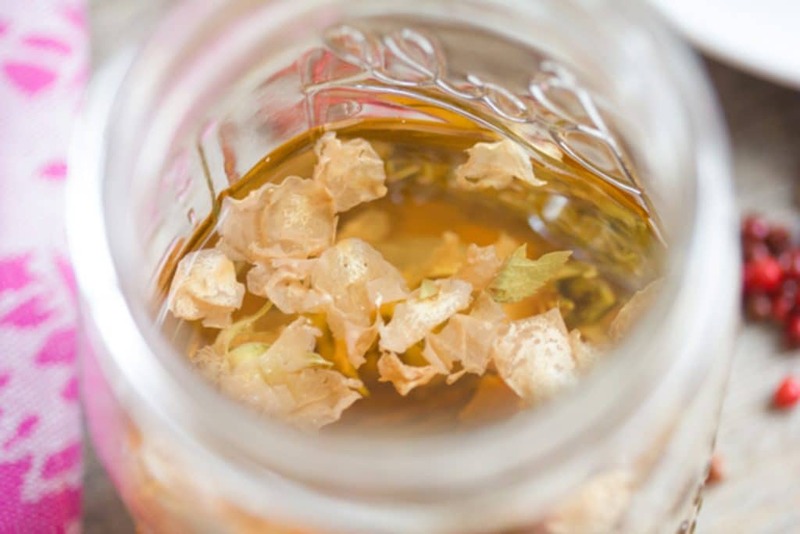 Combine rosebuds and vodka in a mason jar for about 24 hours. 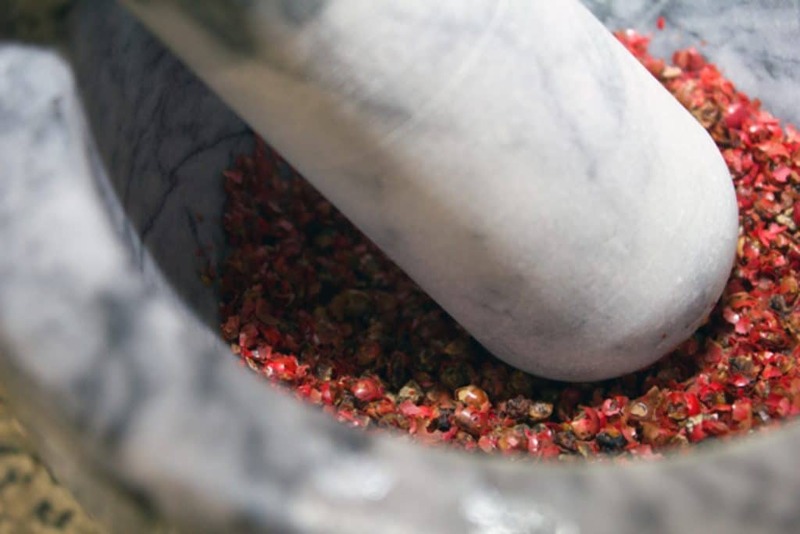 Using a mortar and pestle crush pink peppercorns. If you don't have a mortar and pestle, place the peppercorns in a bag and use a blunt object to crush them. 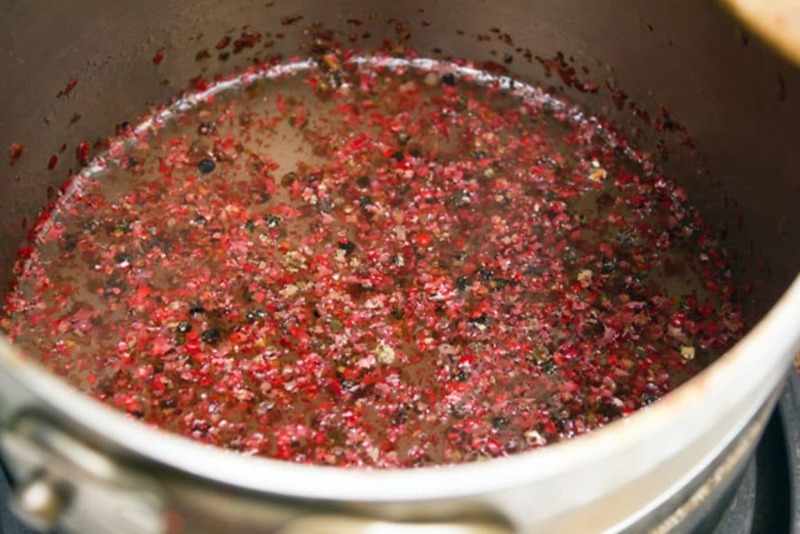 In a medium saucepan, combine sugar, 1 cup water, and crushed peppercorns over medium-high heat. 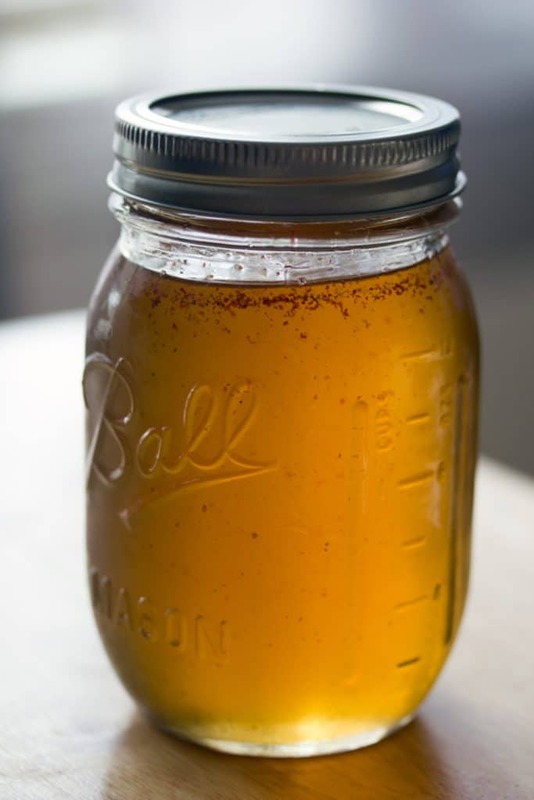 Stir until the sugar is dissolved (about 5 minutes) and then remove from the heat to a bowl or a mason jar and let cool to room temperature. Make two cups of tea, each with 1 cup of water and 1 tea bag. Add 1 1/2 oz. of the rose vodka and 1/2 oz. of the pink peppercorn syrup to each cup of tea. If you want your tea sweeter, add more of the syrup. 12 Responses to "The English Rose Cocktail: Winter Cocktails"
Those pink peppercorns are so pretty. Vodka + tea is the best! Given that last night was the COLDEST NIGHT EVER. 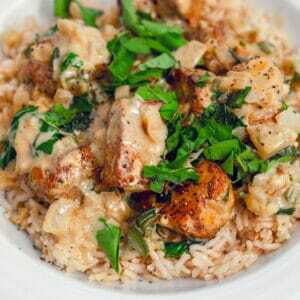 I defintiely wish I had had this as a reward for walking to Whole Foods and back. 20 minutes EACH WAY. I am TOTALLY intrigued by this book! Now full confession is I’m not fond of rose flavor in my food (too perfumy for me) but really curious about the combo of vodka, pink peppercorns + tea. As for those extra peppercorns, they would be really cool on cupcakes, muffins or ice cream? Book looks great! 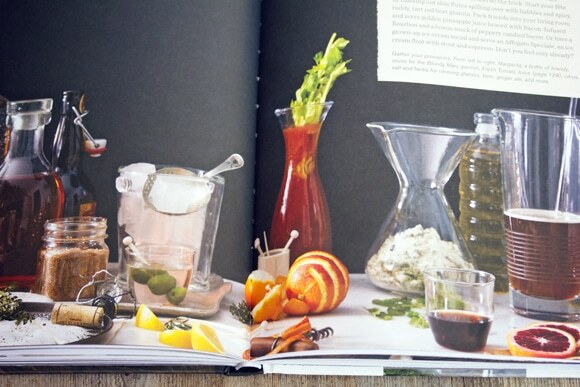 I would love to try all the drinks in this book. 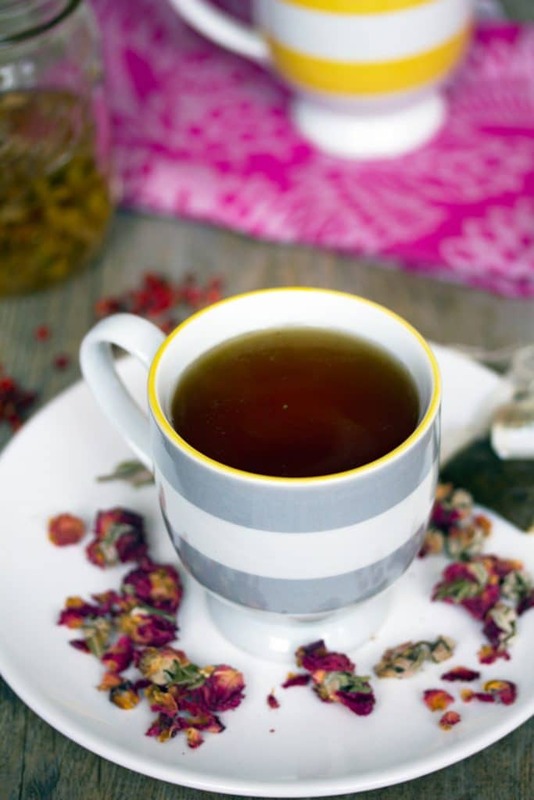 Love the pictures of the tea cups – thanks for sharing! I’m really intrigued by this book. 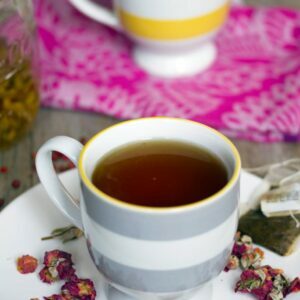 I LOVE tea! I am actually a little obsessed with it so I think I would really love this book. Thanks for sharing! The photos, presentation and the drink itself. Amazing!!! 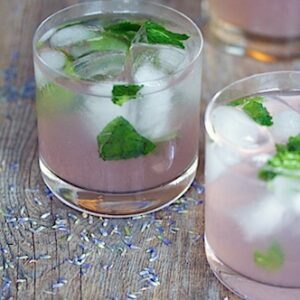 Indeed this cocktail is just perfect to sip on a cold evening…I love the rose in it. Ummm, pink peppercorn simple syrup?!? Sounds amazing!! This is sooo pretty! And sounds delicious. 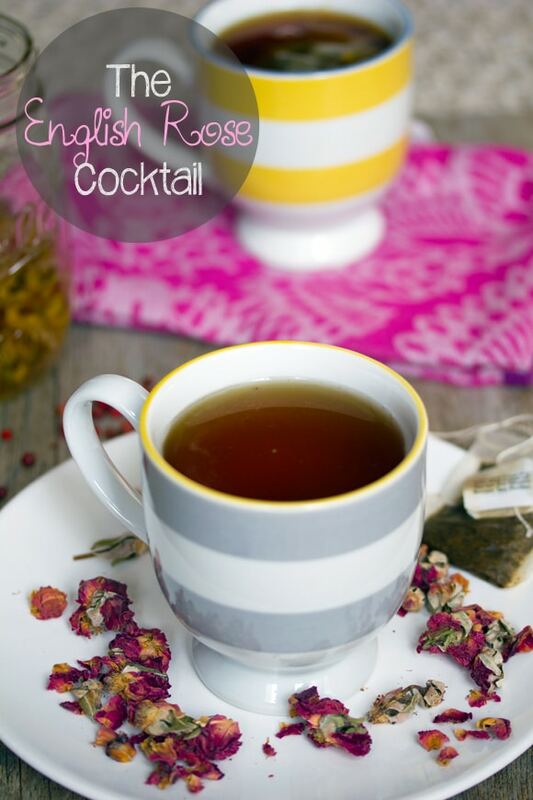 Tea and alcohol, what is better?